If you’re considering buying a cattle handling chute, you have to think about a number of things. For most producers, a squeeze chute plays a vital role in herd management, and it’s also a considerable investment. You want to make sure you get just the right chute, because if you buy something that’s not appropriate for your operation, you’re pretty much going to have to live with it. 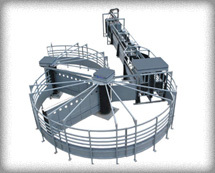 One of the finest cattle chutes on the market is the A.L. Silencer squeeze chute. It’s fully customizable for every need, so the main thing is to determine exactly what your needs are. This sounds obvious, but there are things you’ll need to consider. What type of operation do you need the squeeze chute for? This is the main consideration when thinking about the type of components and adjustments that will work for you. Are you working cows and calves? How big is the herd? What about labor? Where will you locate the cattle chute? Will it be in a permanent location, or will you need a portable chute? A manual chute doesn’t cost much. By the same token, it doesn’t deliver much when compared with hydraulic chutes like the A.L. Silencer. Generally speaking, it’s best to buy the best squeeze chute you can afford. Cutting corners may save you money in the short term, but will usually end up costing you in terms of lost time and labor. Squeeze chutes have pretty much the same features, but the functionality can vary widely. Check out all the features to make sure they’re easily used. For instance, if you need a wheel kit, take it off and put it back on. If you’re not comfortable with the way it works, consider another chute. One of the primary focuses of the chute is the headdoors. Both animal and operator safety should be considered before purchasing. The patented Silencer complete opening-action headdoor maintains equal pressure on the animal, top to bottom. This results in reduced animal stress and injury and more $$$ in your pocket. The factory pressure setting of only 200 psi-top to bottom, cushioned rubber belting, along with the complete opening headdoors promote a calm animal in the chute, and then a smooth injury free exit. Look at the neck bars on the squeeze chute where the animal’s neck is going to be held. Are they straight? This could allow the animal to move its head up and down. Curved neck bars like those on the A.L. Silencer work better to limit movement. Can you adjust the neck bars easily? Can you put a neck restraint on the headgate? The framework on the sides of the cattle chute should attach to the headgate in a way that offers easy access to the animal’s neck for the purpose of giving injections. You should also be able to adjust the width at the bottom of the sides in order to allow for animals of different sizes. Adjustment mechanisms should be easily operated, and recessed so that there’s no danger of you tripping over them. The squeeze chute’s sides should have drop bars. Drop bar lengths can differ from chute to chute, so you should make sure that the drop bars are neither too low nor too high to allow access to your animals. Drop bars should also be easy to raise and lower, and there should be a drop pan on the bottom to give easy access to the animal’s underside. It should be strong enough that it won’t bend, but light enough that you can easily open and close it. The squeeze mechanism controls should be usable without a whole lot of effort, and easy to access. They should also be easy to open and close, and allow for pressure to be removed easily and quickly. They should also be located in such a way that you don’t bump into them by accident. The squeeze chute should have an adjustable lower squeeze for most operations. The added versatility and ease of adjustment are critical determining factors. Squeeze chutes are available with or without palpation gates. 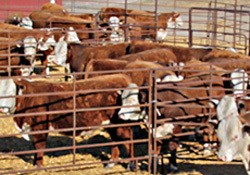 Most ranchers find that this is an essential component, because it provides access to the rear of the animal for procedures like pregnancy checking, castration, and artificial insemination. You might want to have doors on either side for even easier access. You can buy some squeeze chutes with platform or overhead scales. A combined unit has both advantages and disadvantages. A disadvantage is that every time an animal passes over a platform scale, it is weighed, and that means additional wear and tear on the component. The overhead scales promote longer scale life and easier clean-up. You’ll need to think about how often you need to weigh, and consider whether a combined unit is best for you and your herd. "A.L. Silencer Is My First Call For A Silencer"
A.L. Silencer is my first call for a Silencer Squeeze Chute. They’ve delivered & installed Silencers for myself & many of my valued clients.